On May 23rd Mountain Equipment Co-op (MEC) informed the Wolverine Nordic and Mountain Society (WNMS) of a $10,000 contribution from its Community Contributions Review Committee to be used for signage for the TR Trail. The 27 km TR Trail will encircle three quarters of Tumbler Ridge without having to cross over a single paved road. Spurs will lead to waterfalls, rock formations, dinosaur tracks, picnic areas, riverine and creek-side portions, natural swimming pools, spectacular view-sites, and a backcountry cabin. It will also pass the Lions Campground and the Golf Course restaurant. It will therefore offer a tour of the special sites on Tumbler Ridge’s doorstep that combine to make ours such a unique community. The TR Trail is a project of volunteers from WNMS and the Tumbler Ridge Aspiring Geopark Society, with support from District of Tumbler Ridge, Rec Sites & Trails BC, and the Northern Health Authority. It stitches together existing trails – some fall under WNMS, others under the District of Tumbler Ridge, others are user-maintained. Some are narrow improved game trails suitable just for hiking and running, others are shared with ATVs and snowmobiles, others with mountain bikers, cross country skiers and the Saddle Club. The trail will be signed with distance and directional markers so as to be enjoyed in a clockwise direction. There will be five access points to the TR Trail, each with a large sign: at the start beside the Heritage Highway near the gun club, Flatbed Falls parking lot, Lions Campground parking lot, Golf Course parking lot, and at the end near the Saddle Club. These can conveniently break the total distance into four legs. 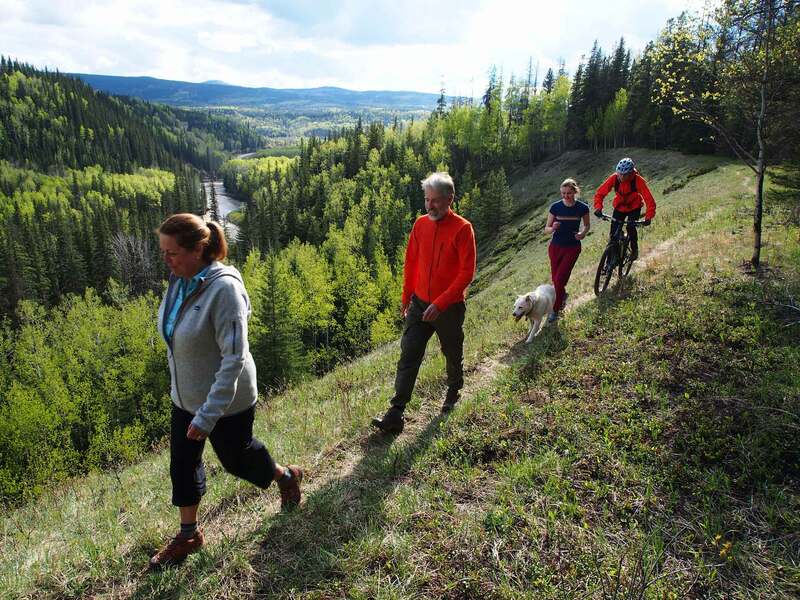 In the longer term, it is planned to extend the trail to form a complete circuit around Tumbler Ridge, which will include the spur up to the Bald Spot. A detailed trail guide will be available at the access points and at the Visitor Centre, with descriptions of the numerous geological points of interest en route. Tumbler Ridge is one of very few communities in the world with the privilege of enjoying such an encircling feature right on its doorstep. This most generous contribution from MEC will allow the TR Trail project to proceed, with completion date set for late summer, to be followed by a Grand Opening ceremony at the Golf Course restaurant.